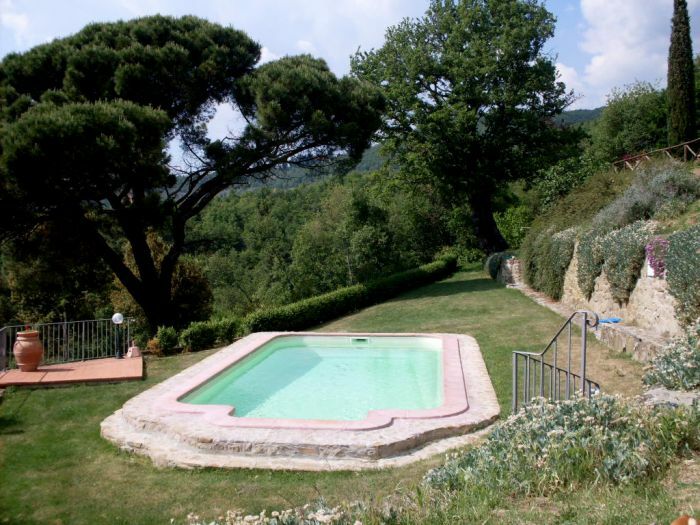 Casa Ronta is located in the Chiantigiane hills of Valdarno, 450 meters above the sea level. The view in unique. You can overlook the typical Blaze, caused by the watercourse’s erosion; they have a hard morphology, with scarps, steep and tight valleys, covered by a rich vegetation. Their geological formation took place in the Pleistocene, about 100. 000 years ago. 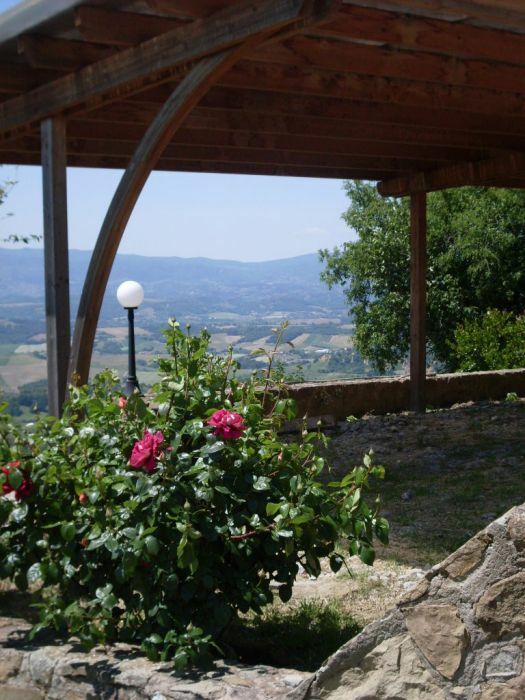 You'll overlook the whole valley between Florence and Arezzo; in clear-sky days you can also see the Amiata Mountains. For this reason it is called “The terrace of Valdarno“. 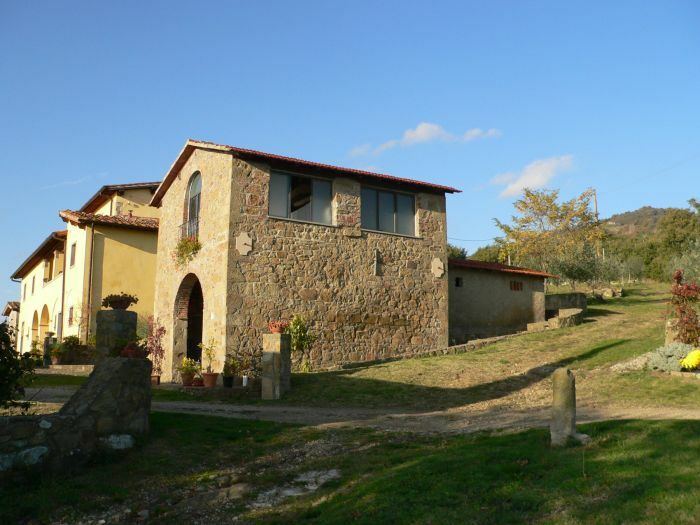 The House is surrounded by Chianti vineyard, olive trees, groves and pine-wood. The farm measures about 14 hectares of natural and uncontaminated environment, ideal for those love tranquility and wide open spaces. Casa Ronta has been recently restored and is available to guests all year round. 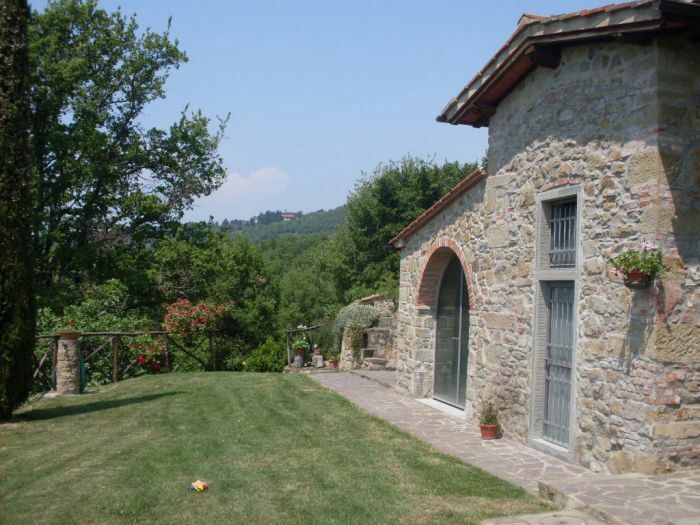 The owners, living in Casa Ronta, will be glad to accommodate you in lovely cozy flats, furnished in Tuscan style. There is a swimming pool used only by the guests. 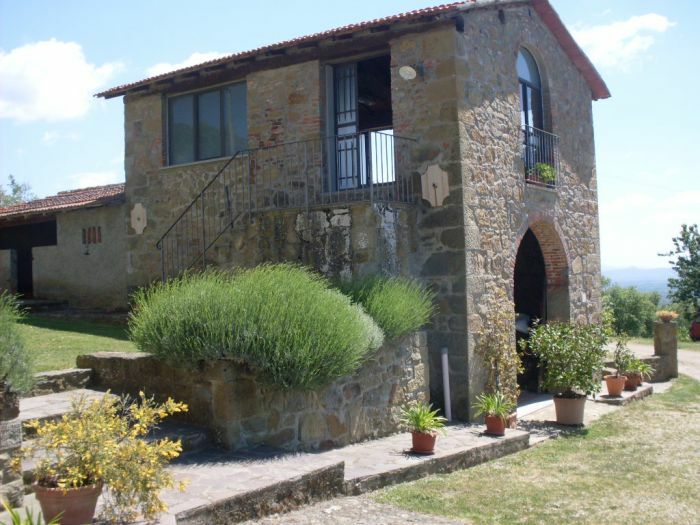 We produce wine and extra-virgin olive oil in the Chianti’s area..
Come and see us to live your perfect holiday in health and relax, far from the frenetic every day life! 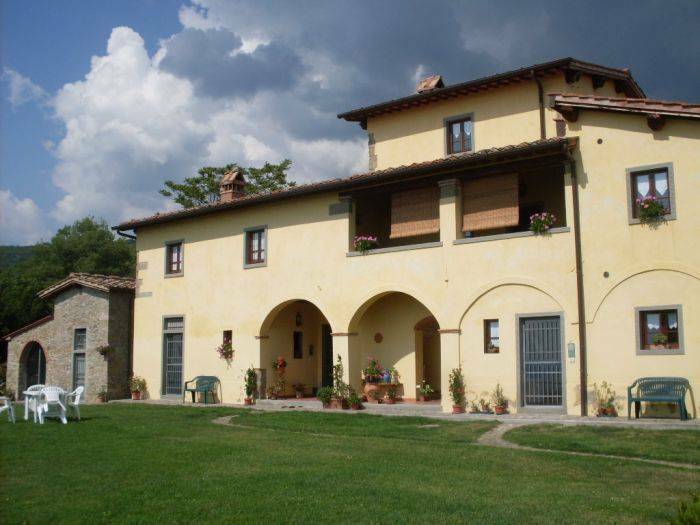 We offer 3 cozy, nicely furnished apartments in Tuscan style for 2-5 people, which can be rented on a daily or weekly basis. All apartments have an independent living kitchen with all necessary applances like oven, fridge and gas burners. There is also a washing machine at disposal for our clients for a small fee (3 Euro per washing cycle). On request we can recommend excellent trattorias with reasonable prices. And if you would like to visit museums or concerts or need assistance with your travelling schedule or train/airline tickets, we will be glad to take care of that for you. Just let us know at the time you make the reservation of the room, because once you get here it might be too late to make reservations for the museums. You will get a confirming email directly from us within 48 hrs after your reservation made on this site. If you don't, please get in touch with us after your reservation to make sure your reservation has reached us. If your reservation is last minute, please call us to confirm your arrival, because sometimes emails have arrived after the clients got here. Check-in will be accepted ONLY BETWEEN 4 PM AND 9 PM (16. 00-20. 00) AND EXCLUSIVELY ON APPOINTMENT. WE DON'T HAVE A RECEPTION AND NOBODY MIGHT BE HERE TO CHECK YOU IN! You might have to wait quite a while, if we don't know the exact hour of your arrival, SO PLEASE CONFIRM THE HOUR OF YOUR ARRIVAL WITH AN EXTRA EMAIL OR CALL! For early/late Check-in/Check-out a surcharge of 10 Euro/person is due at arrival. WE DO NOT ACCEPT ARRIVALS AFTER 9 PM (21. 00) SO PLEASE DON'T ASK FOR IT AND DON'T MAKE A RESERVATION IF YOU CAN'T BE HERE BEFORE 9 PM, EVEN IF THIS SITE WILL ALLOW YOU ANY ARRIVAL TIME! RESERVATIONS WITH ARRIVALS LATER THAN 9 PM WILL BE CANCELLED AUTOMATICALLY! In case of overbooking or arrival after 9 pm despite our recommendation, Casa Ronta reserves the right to CANCEL THE ENTIRE RESERVATION AND CONSIDER IT AS A NO SHOW WITH CONSEQUENT PAYMENT OF THE WHOLE STAY. Apartment IRIS has two double rooms, one with a double bed and the other with 2 single beds (which can be put together), a bathroom with shower and a living kitchen. Apartment GINESTRA has a double room with 2 single beds (which can be put together), a big living room with a double bed sofa, a bathroom with shower and a living kitchen. Apartment ERICA has a double room with a double bed, a living room with a single bed sofa, a bathroom with shower and a living kitchen. All apartments are non-smoking, we are a non smoking house. Of course our clients can smoke in the open air area around the house. On request we serve breakfast in the main house (5 Euro/day/person). Minimum Prices (per apartment/night): 2 people: 70 Euro/Overnight stay 3 people: 90 Euro/Overnight stay 4 people: 120 Euro/Overnight stay Extra bed for children 0-3 is free, please reserve when making reservation Children over 3 until 12 years will have their own bed and therefore have to be indicated as an adult, even if you intend to let them sleep in your bed. On request we will put at your disposal baby beds, from 4 years on they shall have their own bed. In case that children have not been indicated in the reservation, an extra fee will be applied in addition to the booked price and/or the apartment type changed to more beds (if available). The extra bed is 25 Euro/night or 150 Euro/week. Best ice cream bar in the area! For cancellations 7 or less days from the date of arrival and in case of no-show 100% of the total amount of the stay is due (minimum 2 nights). After arrival at Casa Ronta the whole amount of the stay is due, changes are not accepted (prolongation of the stay are possible only if there is vacancy). * From the airport Amerigo Vespucci: Shuttle until the train station S. M. N.
* From the central train station S. M. N. Firenze: Train to Montevarchi, then take a taxi. Take highway A1 Roma-Firenze: Exit "Valdarno", after leaving the Highway drive towards "Terranuova Braccioini" and then towards "Loro Ciuffenna". Once you arrive at the roundabout in Loro Ciuffenna, turn left towards "Castelfranco di Sopra". After 3 Km on “Setteponti Ponente” street, on your right you’ll see a sign “Via Setteponti Ponente dal 26 al 31”, drive up for about 700 m and you'll reach CASA RONTA. Most likely you'll be best off renting a car. If you prefer to take a taxi make sure the driver turns the taximeter on.